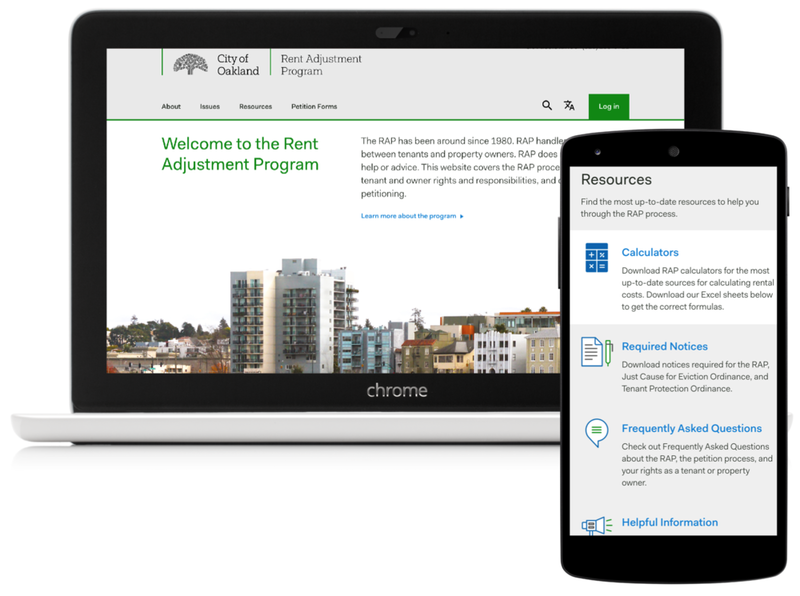 The City of Oakland Rent Adjustment Program (RAP) was established in 1980 and functions as a mechanism for fostering healthy relationships between property owners and tenants, being an arbiter between property owners and tenants allows us to promote better housing and housing investment in the City Oakland. We redesigned the City's online RAP portal in early 2017 to improve transparency, foster trust in the process, and to make it more accessible, by taking a user first approach. Initially, upgrading the Rent Adjustment Program Database and Online System was identified as a top priority. CDL team saw this as an opportunity for improving civic engagement by facilitating conversation between renters property owners, and the city staff. Opportunity: $365,000 was allocated in City’s budget for RAP database redesign, and Chief Resilience Officer and CDL Founder Kiran Jain, in partnership with 100RC led the efforts. Process: pre-workshop with stakeholders to inform an RFP for RAP database work and relationship building; user research report and implementation with new ordinance. Delivery: research and execution of responsive website and online application in less than 5 months. We worked with Tomorrow Partners to facilitate a two-day pre-workshop with key stakeholders of the portal -- the City staff, community members that include both property owners and renters, as well as local community organizations and housing advocacy groups -- to understand the key priorities and pain points of the current RAP process. We worked with Frog Design to test an early prototype of proposed RAP portal, to start conversations between property owners, renters, and the City staff. The workshop allowed participants to gain insight into each other's needs and fears, as well as to build some alignment in terms of what features should be prioritized and to collectively imagine what success would look like. The Rent Adjustment Program works through petitions. Renters may challenge a rent increase if they believe it is more than the allowable amount. An increase in rent that is more than what is allowed must meet the criteria in the Rent Adjustment Ordinance. Renters may also petition for a decrease in rent paid due to a loss of service. Disputes are settled through mediation or a hearing. Hearing Officers make decisions based upon review of information from both tenants and property owners. The Rent Adjustment Program allows property owners to petition for pre-approval of a rent increase. Property Owners may petition for an exemption from the Rent Adjustment Program for qualifying properties. Property Owners may also apply to remove a property from the rental market as allowed by the Ellis Act. Renters must submit a petition to contest a past or present rent increase.